It's funny watching dogs do human things. It's funny to watch them drive cars. It's funny to watch them sit in chairs. But, seriously, new research shows that dogs actually are just like us. At least they are when it comes to processing voices and emotion—and, now, we've got the brain scans to prove it. A new study from Eötvös Loránd University in Hungary shows that dogs have the same kind of brain system for processing voices that humans have. This part of the brain can also interpret emotions in the same way that humans do. Dogs: They're just like us! The experiment itself is groundbreaking as it's the first neuroimaging study to compare a nonprimate species to a primate species. It's really simple, too. 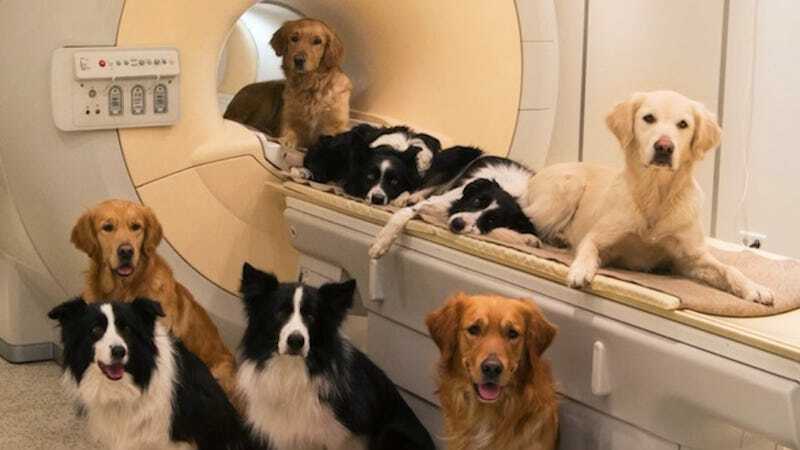 The researchers just stuck 11 dogs in an MRI machine* and watched what happened when they played nearly 200 recordings of both dog and human sounds. A group of 22 humans listened to the same recordings while inside the machine, and the researchers compared the brain scans. Turns out the voices lit up the same brain regions of both the dogs and the humans. Dogs responded more to dog voices, and humans responded more to human voices. But both species reacted to specific emotions in similar ways. The sound of a dog whimpering had a similar effect on the dog brain as the sound of a human crying had on a human brain. The dogs also responded to human voices, and the brain scans showed that the dogs could tell if the humans were happy or sad. This is exciting news, although it's not entirely unexpected. After all, dogs and humans share a common ancestor 100 million years ago, and scientists expect that evolution favored particularly sympathetic dogs starting about 15,000 years ago when man's best friend was first domesticated. As Wired points out, though, the study does leave a number of questions unanswered. What, for instance, do the dogs actually hear when they hear a human voice? We'll never know until we find a way to read dogs' minds. * - If you're wondering how exactly the researchers got the pups to go into the MRI machines and—more importantly—stay still, the answer is dog treats. Lots of dog treats.